You haven’t been to a waterpark until you have been to Yas Waterworld in Abu Dhabi. Boasting 45 rides, slides and attractions, this waterpark is an iconic destination that needs to be seen to be believed. Now, visitors have even more reason to visit Yas Waterworld Abu Dhabi. This impressive Yas Island venue was recently named the world’s leading water park at the World Travel Awards 2018, beating globally renowned competitors such as Orlando’s Typhoon Lagoon and Spain’s Siam Park. So what are you waiting for? Book your tickets now to this aqua zone in the UAE capital and get ready for a day filled with adventures in the water for the whole family. 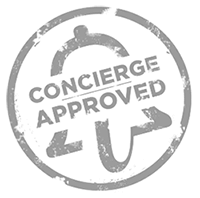 Day passes for myconcierge members also include a meal at Yas Waterworld Abu Dhabi. Inspired by the Emirati pearl diving legend, the park boasts the world’s longest and fastest tornado water slide, the largest surfable sheet wave and the twisting, turning serpentine ride that is Slithers Slide, among many others. When you need a break from all that action, head to the Hairat Yas Pearl Diving experience, where experts will show you how to dive and find hidden treasure. Once you have plucked an oyster from its bed, open it to see if it contains a dazzling pearl – the ultimate reminder of this unique experience. Little ones – as well as and not-so-little ones – will also enjoy exploring Marah Fortress. The ultimate water playground, it comes complete with slides, a water-shooting geyser, water cannons and much more. And if all that excitement leaves you feeling hungry, worry not, as Yas Waterworld boasts an appetising range of food outlets. Traditional Turkish ice cream at Farah’s Flavours, fried chicken and pizza at Chubby’s Kitchen and barbecue delights at Dana’s Diner, are just some of the options available. Finally, head to one of the six shops at Yas Waterworld to pick out a souvenir, including Jewana Photo or Bandit Bomber Photo for that picture-perfect memento. Yas Waterworld Abu Dhabi in its absolute discretion, reserves the right to vary the opening and closing dates and times of the attractions and to close, remove or cancel all or any part of the rides, events or facilities within the attractions for any reason including, but not being limited to technical, health and safety and/or operational reasons or due to special events or private functions. Additional terms and conditions issued by Yas Waterworld Abu Dhabi may apply.